Create a spa-like feel in your own bath with luxurious knitted towels and accessories. These designs offer a clean, modern look in contemporary colors and fibers. Most patterns are easy to intermediate in skill level and are quick knits that will have your bathroom looking its best in no time. Looking to knit the perfect gift? These items make thoughtful housewarming or hostess gifts, and are also great for recent grads and even new moms. 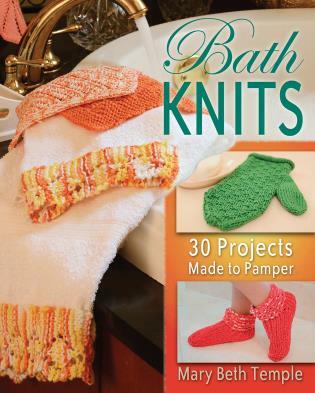 • Features washcloths and mitts--even a robe, slippers, and pedicure socks! Mary Beth Temple is a knit and crochet pattern designer. Her independently published pattern line is Hooked for Life, which is available online through Ravelry and Patternfish and at local yarn stores. She is also the author of The Secret Language of Knitters, Hooked for Life: Adventures of a Crochet Zealot, and Curvy Girl Crochet: 25 Patterns that Fit and Flatter. She lives in Wilmington, North Carolina.